. There are also many paintings and decorated lacquer boxes in which persimmons are depicted, most dating from the Edo period. One, for example, is a painting b y Sakai Hoitsu (1761~1828), included in the series called “Flowers and Birds of the Twelve Months” (owned by the Imperial Household Agency), and which relates to the month of September. It shows red persimmons hanging from the branches and a pair of pale green white-eyes on the trunk. The contrast of colours in this painting is superb, and there is a touch of playfulness in the attitude of the little birds.
. Basho’s poem is a beautiful description of a happy village which has enjoyed peace for many years. Considering the fact that he spent most of his life in wandering, I think Basho must have had a rather complex reaction to the scene, which we might say is mixed with envy. 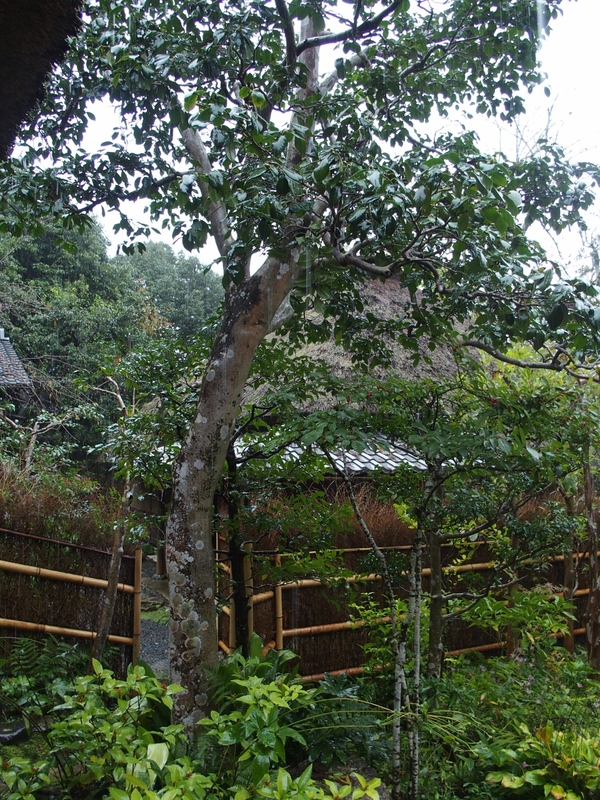 Kyorai’s poem concludes “The Story of Rakushisha” (House of Fallen Persimmons), which he wrote to explain why he had chosen this rather unusual name for his cottage. Apparently, his cottage had forty or fifty persimmon trees standing around it, but the keeper whom he had hired to look after it had never sent him any persimmons. So, one year, he went to see for himself, and found the trees loaded with fruit. 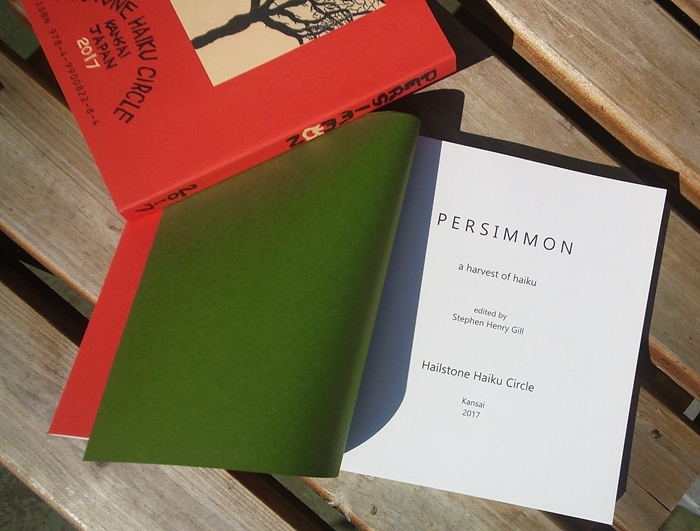 Soon a merchant came and offered a large sum of money for the persimmons. But a night storm knocked all the persimmons down. Next morning, the merchant came and complained that in his long career as a merchant he had never had such an experience, and asked Kyorai if he would return the money. Rather unwillingly Kyorai consented. So, the above haiku is not a simple description of his cottage. 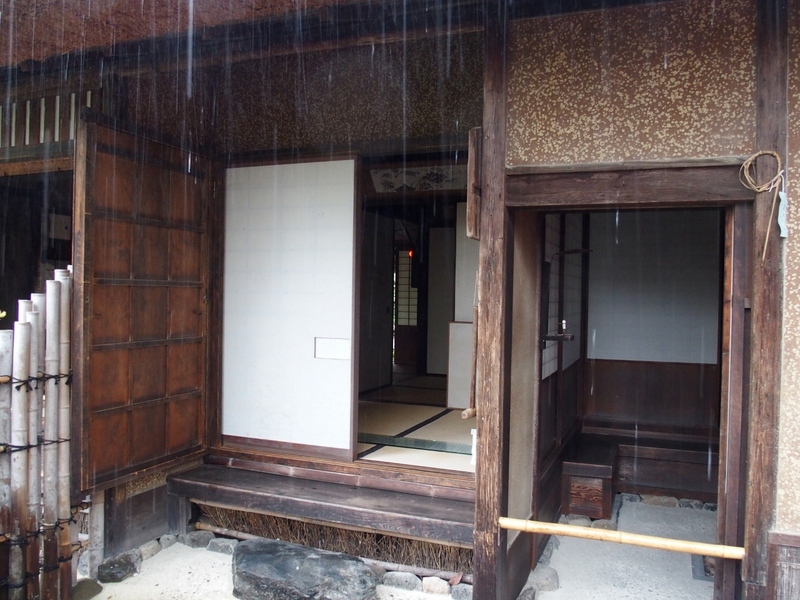 The present Rakushisha Cottage is a later reconstruction. We do not know the original site, but judging from the haiku quoted above, it may have been closer to Arashiyama (“Storm Mountain”). Anyway, Kyorai expresses his fear of the storm that comes from the mountain straight down to his persimmon trees. 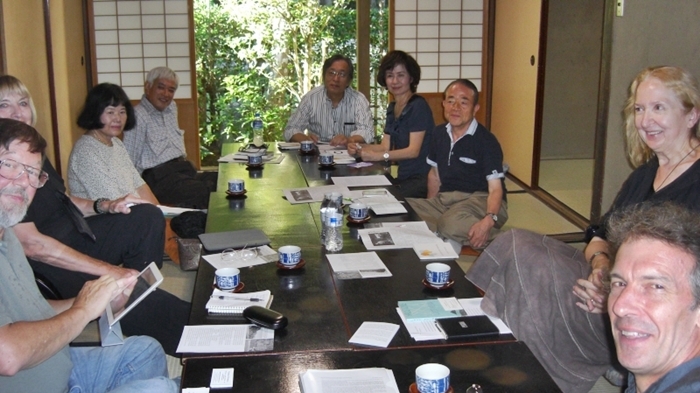 Shiko was the leader of the group of haiku poets called Mino-ha, but his poems are said to lack depth and complexity. The poem I quoted above is, I believe, derived from a poem by Basho, but it has neither the depth nor the complexity of the model. That is why I used the word “stomach” to translate harawata. This Japanese word is normally translated as “intestines” or “guts”. I felt that Shiko is simply referring to a physical, rather than a metaphysical, phenomenon. The Imperial Palace Persimmons mentioned in Buson’s poem are the sweet persimmons I referred to in an earlier instalment. I believe birds liked them very much. So a scarecrow was entrusted with watching over them. I wonder what kind of expression the scarecrow had on his face? He must surely have looked proud, but at the same time he would have known the limit of his power. So, I take Buson’s poem to be rather humorous. I only wish Buson had left a painting of this scene, too. Issa’s poem expresses not only his sympathy for the last persimmon hanging on the top branch, but also sympathy for himself. Issa says the persimmon is sour, yet sour persimmons usually become sweet in late autumn. 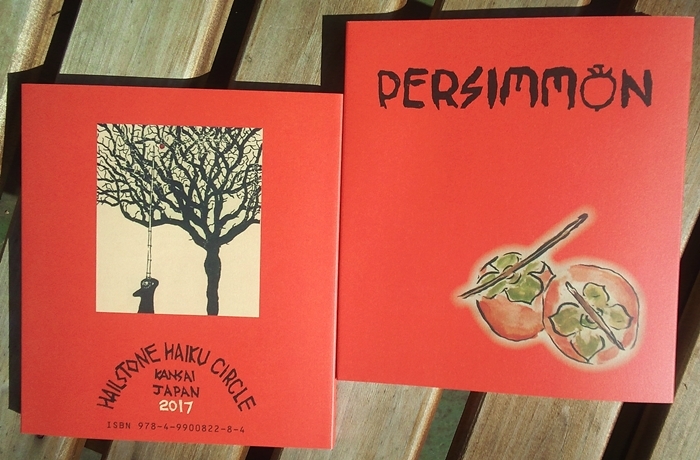 The sour-sweet persimmon hanging from the top branch is a symbol of his own life. Issa has many poems about persimmons, and I am tempted to quote two more.
. These two poems recall Issa’s childhood experiences. How skilfully he describes a child’s point of view! Sep. 27. Fine autumn weather. Rakushisha (The House of Fallen Persimmons), Saga, Kyoto. 10 poets assemble. Tito has already taken guests from America, Charlie Trumbull, Cynthia Henderson and Lidia Rozmus to Saigyo’s Well and Kyorai’s Grave. 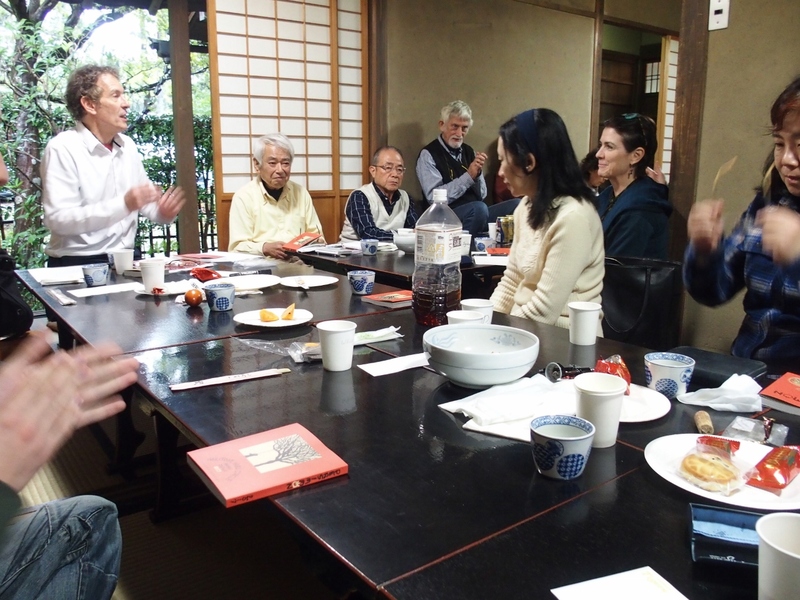 The meeting itself begins with readings of Kyorai’s Record of the House of Fallen Persimmons and Days 3 & 17 of Basho’s Saga Diary, which the poet had written in 1691 while staying at this cottage. 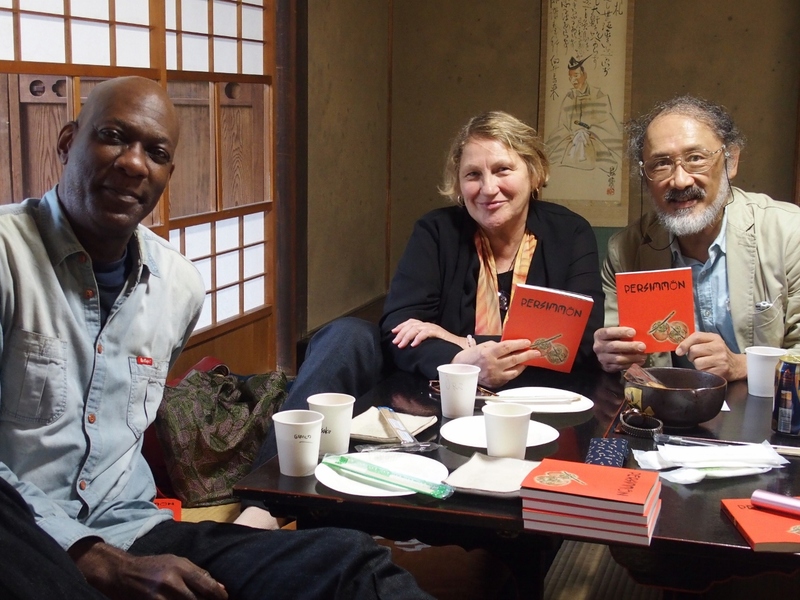 Hisashi reads the Japanese originals and Tito, the new English translations they have prepared. During the tea break, Lidia decorates the back room with display panels of American Haiga (many of them, her own beautiful work). 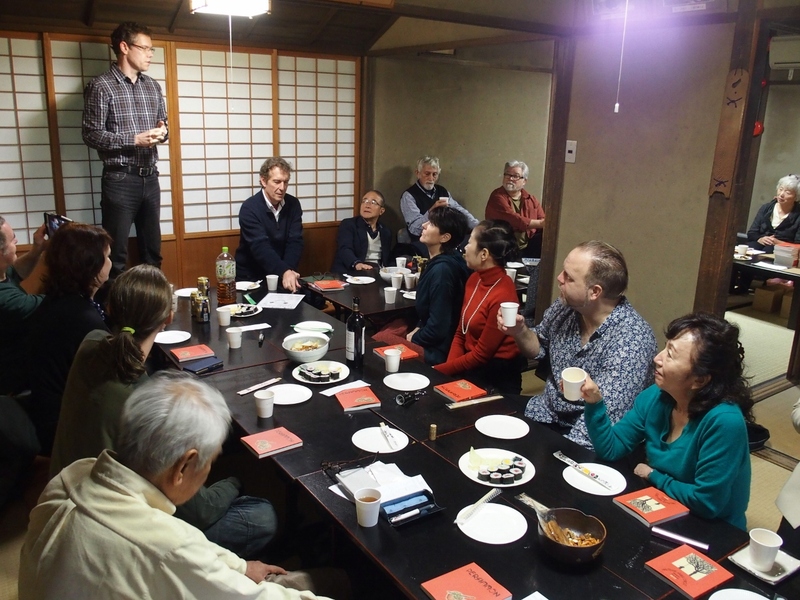 Charlie then presents to the group on the subject of Japanese Influence on English-language Haiku. Fascinating stuff. After an exchange of ideas, Lidia follows with her own Approach to Haiga, and we enjoy looking at the mini-exhibition of examples she has brought along. There follows a stroll in the autumnal garden (purple berries, orange persimmon leaves) and on through the nearby bamboo groves to the Oi River, where a local friend of Tito offers the poets a covered wooden punt with a robed man at the prow. 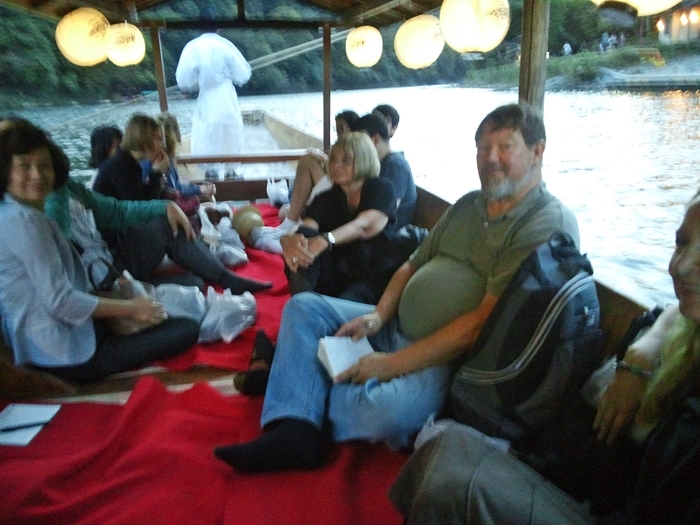 In jovial spirits, we are poled upstream a little way, then slide back down the river in the warm dusk … Our thanks again to our guests for having visited and given us so much on this happy day.